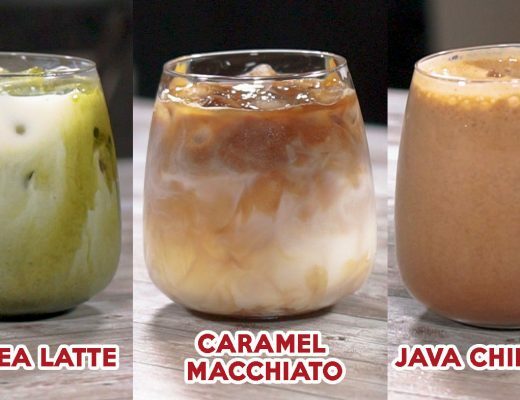 There are just so many different variations of breakfast toast. From simply spreading peanut butter to intricate sandwich combinations, toast is a versatile and quick go-to breakfast option. 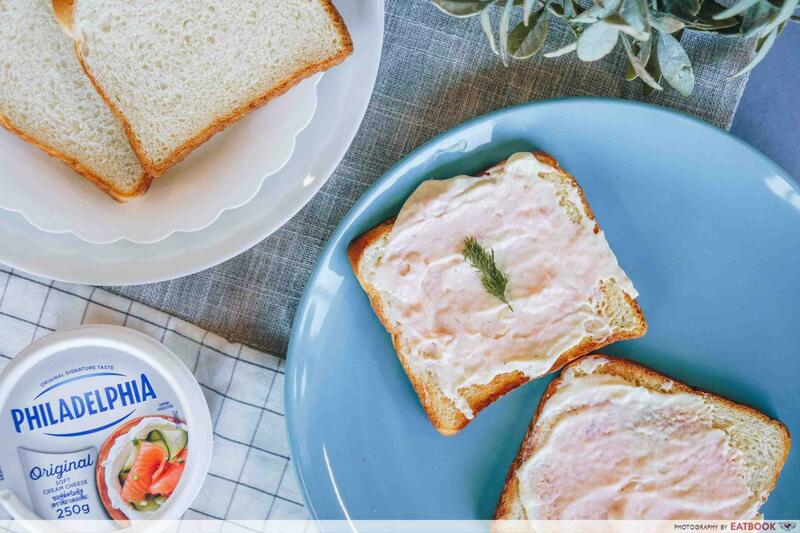 Looking for a refreshing alternative to your usual sandwich spread? Here are six quick and easy breakfast toast recipes you can try out in the comfort of your own kitchen. Give sweet kaya an added boost of creaminess with cream cheese. The sweetness of kaya may be overpowering; add a generous dollop of cream cheese to help cut the sugariness. Put all that between buttery French toast and you’ve got a luxurious breakfast that is fit for any occasion. 1. 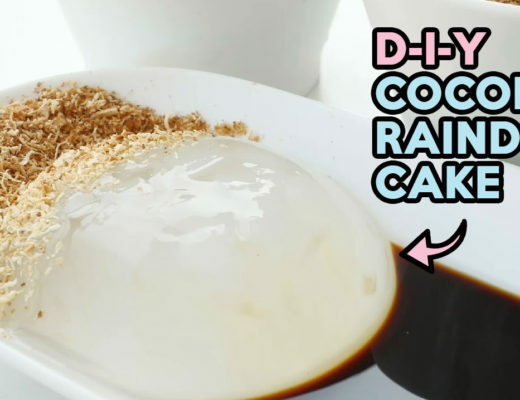 In a mixing bowl, mix kaya with PHILADELPHIA Spreadable Cream Cheese. 2. Prepare the French toast mixture by whisking eggs and milk together. 3. Dip bread slices into the egg mixture, making sure both sides are well coated. 4. Melt butter in a nonstick frying pan. Place bread slices and cook on medium heat until golden brown on each side, about 2-3 minutes. 5. 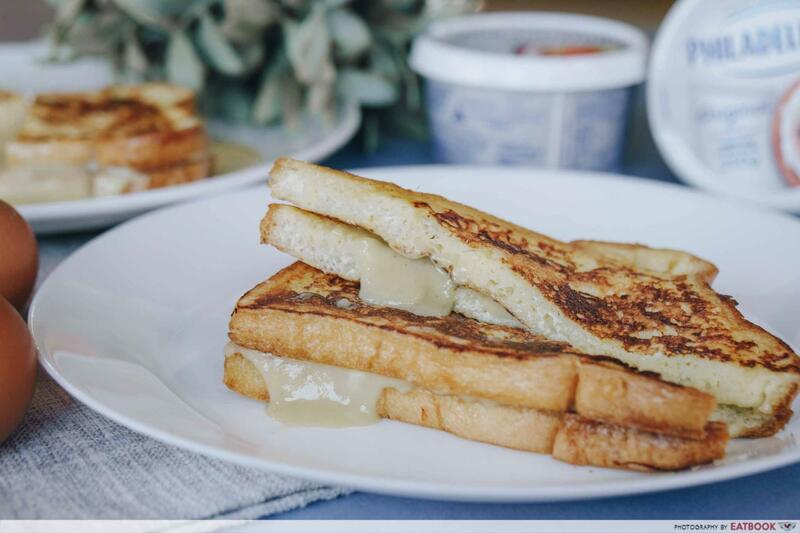 Generously spread the kaya and cream cheese mixture onto a slice of French toast, put the second slice on top, then slice diagonally and serve. Eggs and bread are one of the best ways to start the day. 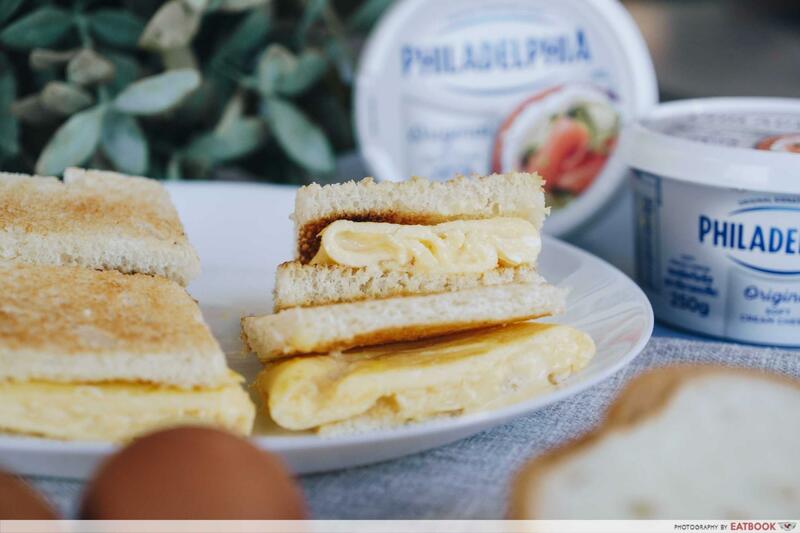 Give a touch of elegance to the regular omelette by adding creamy PHILADELPHIA Spreadable Cream Cheese to it. The cream cheese melts beautifully to give a rounded creaminess to the soft eggs. The trick here is to make sure the eggs don’t overcook and solidify. Make sure to watch the heat, and don’t be afraid to take the pan off the stove if the eggs look like they’re about to burn. 1. In a mixing bowl, beat the eggs and salt until the eggs are properly mixed together. 2. Melt butter in a large non-stick frying pan on medium-high heat. Pour egg mixture when butter starts foaming. 3. Scramble eggs rapidly with a spatula while breaking up the curds and scrapping the side of the pan. 4. Stop stirring when eggs are scrambled and creamy, about 1 to 2 minutes. 5. When the eggs have thickened and no visible liquid egg remains, add PHILADELPHIA Spreadable Cream Cheese, spreading it evenly around the egg. 6. Carefully fold the omelette from one end to another. 7. Cut the omelette into half and sandwich it between two slices of bread and serve. Toast does not need to be boring. 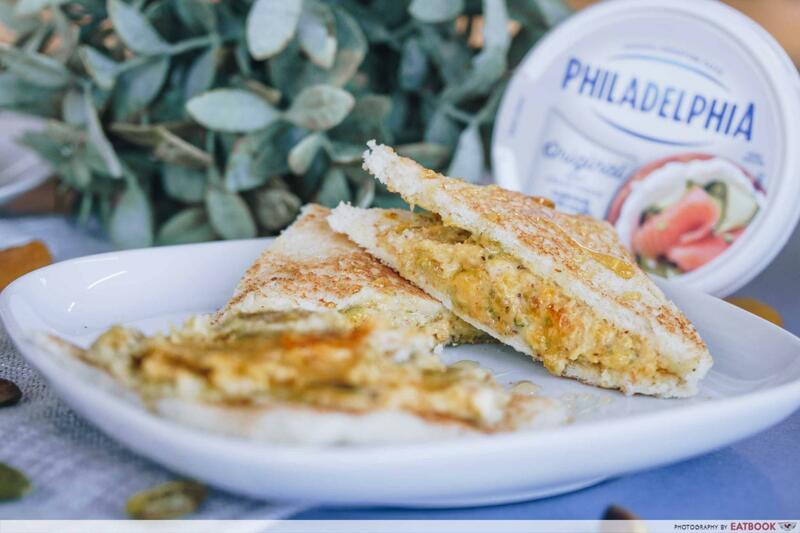 Jazz it up by blending smoked salmon together with PHILADELPHIA Spreadable Cream Cheese and heavy cream. The smoked salmon packs a huge punch of savouriness, with the cream cheese and cream giving a rich and decadent finish. Don’t forget to put in a few sprigs of dill to give a fresh and clean flavour to the spread. 1. Pulse salmon, PHILADELPHIA Spreadable Cream Cheese, double cream, lemon and dill in a food processor. 2. Spread mixture onto toasted bread and garnish with a few sprigs of dill and serve. Breakfast spreads don’t always have to be smooth all the time. There are always days when you want a little more chunks in your spread. Adding crunchy pistachio and chewy apricots to PHILADELPHIA Spreadable Cream Cheese is a healthy way to start the day with fresh ingredients! 1. Pulse pistachio nuts, cream cheese, apricots and honey in a food processor. 2. Spread mixture onto toasted bread and drizzle additional honey to taste before serving. For a quick and easy breakfast, simply blend blueberries with cream cheese. 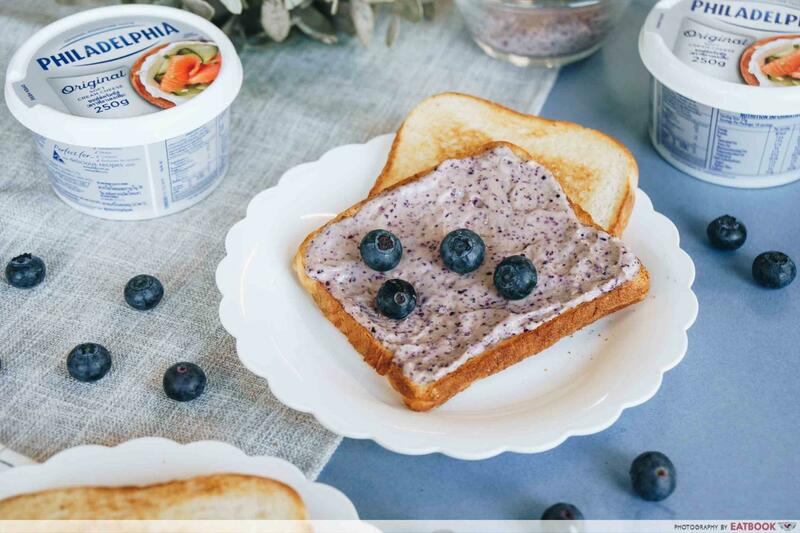 The blueberries give off a beautiful purplish hue while also lending a sweet and tart taste to the breakfast spread. Depending on the type of blueberries used, the spread might be a little sour, so be sure to add honey or sugar to taste. 1. Pulse blueberries, cream cheese, and honey in a food processor. 2. Spread mixture onto toasted bread and serve. 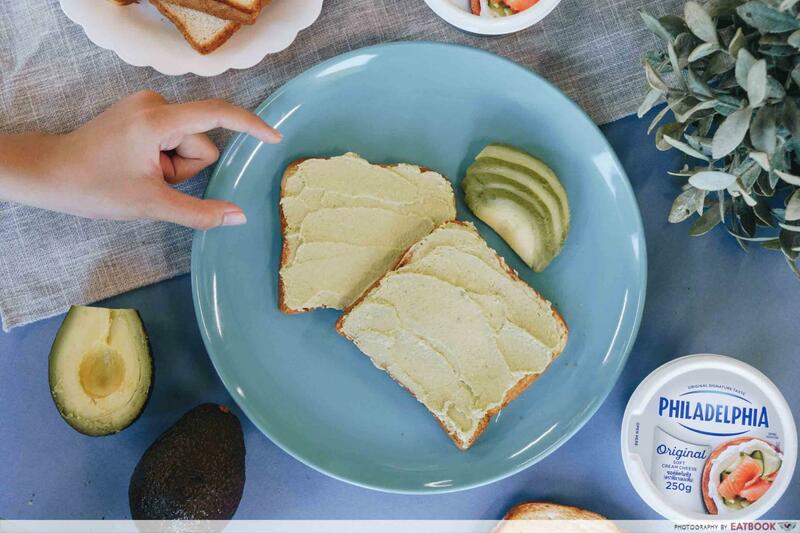 If you’ve always enjoyed avocado toast, try out this recipe with the addition of cream cheese. This simple spread takes just minutes to make and adds an extra creamy and buttery mouthful, thanks to the avocado and cream cheese. The touch of lemon juice and minced garlic also adds a little acidity and punch to the spread, making it ideal for a hearty brunch. 1. In a mixing bowl, mix avocado, cream cheese, lemon juice and minced garlic. Season to taste. 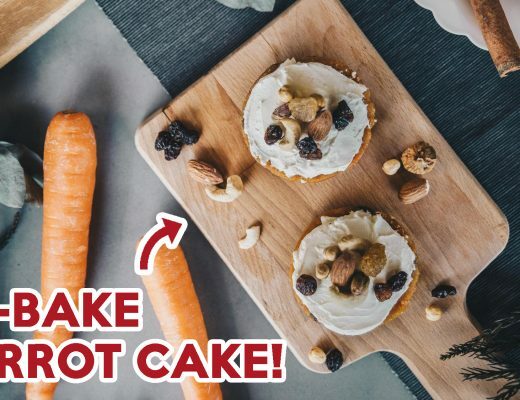 If you’ve always added plain old kaya or peanut butter to your toast, check out these six simple recipes made with cream cheese for a refreshing twist. 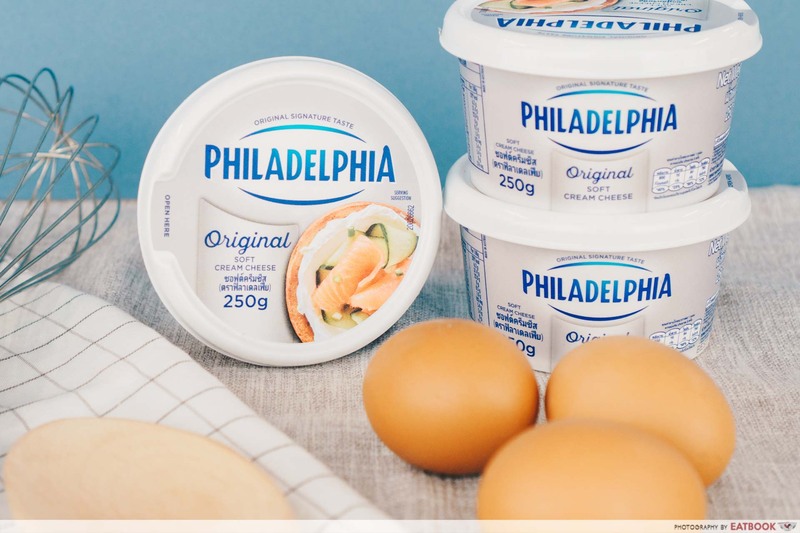 Fresh and easy to spread, PHILADELPHIA Spreadable Cream Cheese ($6.30 for 250g) can also be an alternative to butter, as it contains 60% less fat* and gives a creamy texture to any breakfast spread! 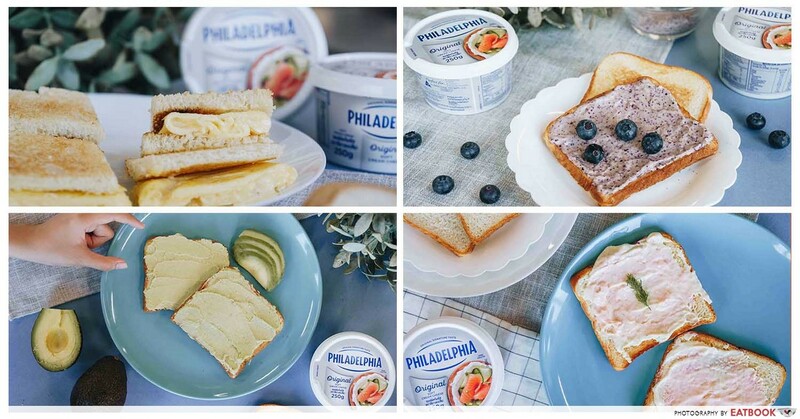 *PHILADELPHIA Original Spreadable Cream Cheese has 31.4g of fat per 100g vs butter, which has an average of 80g of fat per 100g.